Yantai (Laiyang), the city where we are located, is the birthplace of Praying Mantis Boxing. The Praying Mantis Fist, or Tanglang Quan in the Chinese language, was a popular fist during the Han Dynasty. The fist alone holds a rich history that goes beyond 200 A.D. The fist is very important when in close combat. To learn Mantis Fist seriously, there are professional Praying Mantis Fist masters in our Shaolin Kung Fu academy in China. The Mantis Fist is an essential Kung Fu style and offers great value in improving a person’s health. It was a popular fist in certain cities, mostly in the city of Laiyang in Yantai, as well as the City of Qingdao. The fist had originated from Yantai and gradually spread to other cities in China and then all over the world. The Mantis Fist was created by Wanglang. Wanglang was a skilled martial arts warrior who lived during the Han Dynasty. He had spent a lot of time roaming many Chinese cities and towns, meeting a number of chivalrous friends as well as masters who were able to teach him a number of great skills. However, he later lost in a Kung Fu competition, and he became devastated and distressed. While lying under a locust tree, he saw two praying mantises battle viciously over an insect. The mantis had assumed various positions like hooking and jumping, defending, pulling, and locking. Inspired by the mantis’ movements, he then imitated the mantis’ movements, therefore creating a structure of the Mantis Fist. He then continued practicing until he became very skilled. He then went back to challenge the man who had defeated him and subsequently outmatched his opponent. Students practicing Mantis application in Kunyu Mountain. Wanglang would later integrate the parts of the famous 18 fists and adopt monkey movements in the forming of the fist. 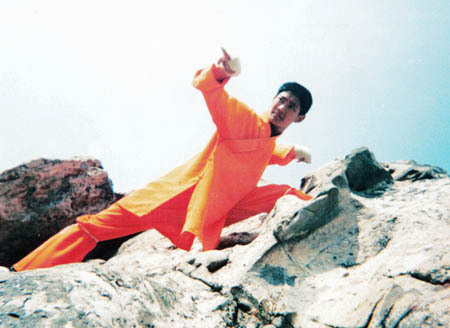 The Mantis Fist was eventually perfected and became the fastest and most agile fist ever in Kung Fu. The Mantis Fist is one of the many Kung Fu styles taught by skilled masters here at Kunyu Mountain Shaolin Kung Fu School.